Get Ready for thrill that will leave you smiling from Ear to Ear, This is a 1 Hour Hot Lap of the Gold Coast Broadwater. Blast your way along the sub-tropical shores, weaving your way up close to the beaches, sand bars and mangroves. Get Ready for thrill that will leave you smiling from Ear to Ear, This is a 2 Hour Hot Lap of the Gold Coast Broadwater. 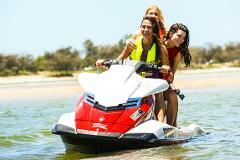 Blast your way along the sub-tropical shores, weaving your way up close to the beaches, sand bars and mangroves. Get Ready for thrill that will leave you smiling from Ear to Ear, this is a 3 Hour Hot Lap of the Gold Coast Broadwater. Blast your way along the sub-tropical shores, weaving your way up close to the beaches, sand bars and mangroves. This is a Half Day Tour of the Gold Coast Broad water. This is a fully inclusive tour offering a fully inclusive Breakfast and Lunch on some of the islands most popular resorts. Snorkelling is also included plus videography of your day. This is a Half Day Tour of the Gold Coast Broad water. This is a fully inclusive tour offering a fully inclusive Breakfast, Beach Buggy's , sandboarding, Snorkelling is also included plus videography of your day. This is a Full Day Tour of the Gold Coast Broad water. This is a fully inclusive tour offering fully inclusive Breakfast / Lunch, Beach Buggy's , sandboarding, Snorkelling is also included plus videography of your day.